I finally returned to embroidery after about 5 years! 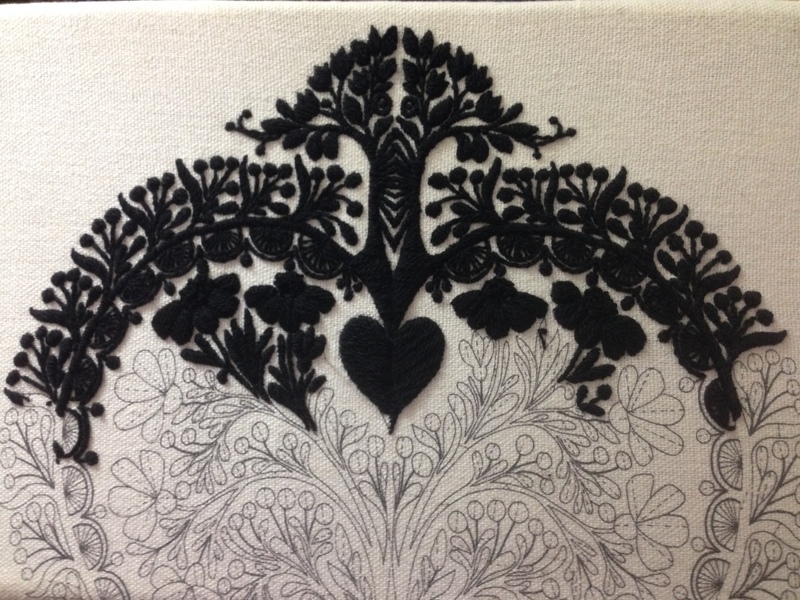 I made some progress on the Swiss Folk Heart crewel kit mentioned here. It’s slow going but I hope it won’t take another 5 years. I think the embroidery is ehhhhhh (and the smartphone pics) but I’m not going to let that stop me. Finished! Utterly, completely, absolutely nothing left to add, finished. Except I haven’t posted it to my mom yet. But still! It is technically done even if the recipient of the gift hasn’t received it, right? To the best of my knowledge, I designed the honeycomb border, row 2, 3, 5, 6, 8 and 2/3 of row 10. If you haven’t already, you can see the design process in these previous posts: here, here and here. Check out the amazing curtains I found in a thrift store! Thrill at the sight of our Ikea table and chair. Also, embroidery. I already wrote in exhaustive detail about the embroidered comic (why on earth did I think this was an appropriate subject for my mom’s present?) so I’ll just write about the remaining rows. 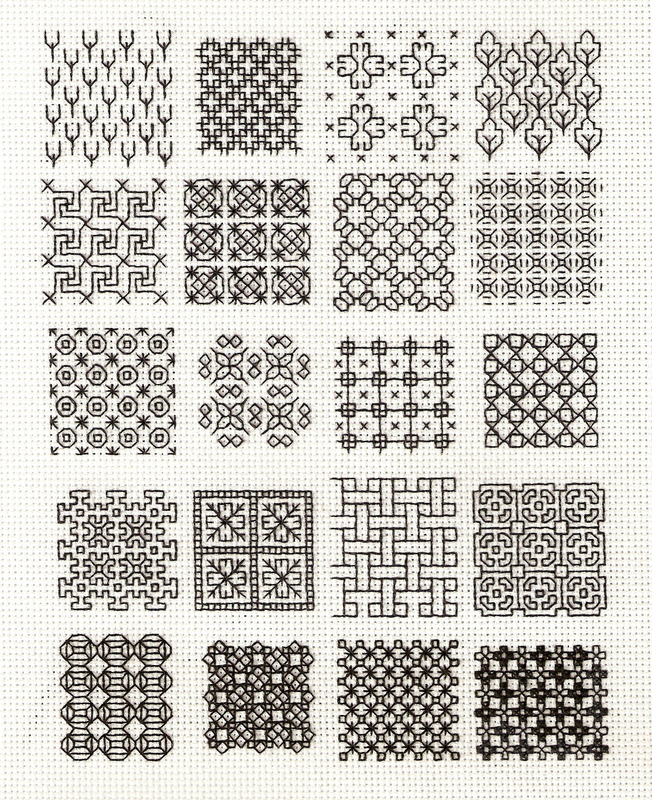 The ninth row is from Wilkins’ book Traditional Blackwork Samplers and I freakin’ love it. I think it’s so clever and it really does look like a row of irises. 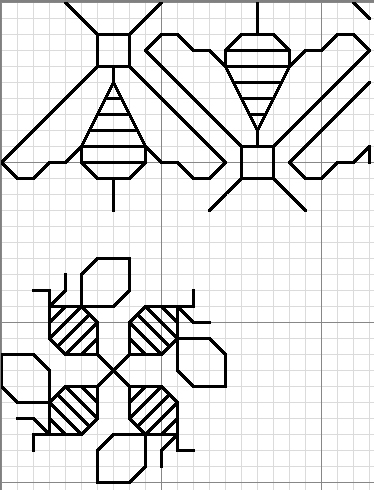 The tenth row uses a flower band from The Beginner’s Guide to Blackwork and I added a repeating bee of my own design and the wheat (it’s supposed to be wheat) in the center. The eleventh row is based on this Flickr image and it reminds me of a stained glass window from a craftsman style house. The twelfth band is from the Beginner’s book and the thirteenth is from this etsy seller. I’ve blatantly stolen her design and I hope she doesn’t come after me. She’s got lots of cute blackwork and once the cashflow has been sorted I plan on buying a few because I can’t quite work out the count. I’m also really proud of the alphabet I used. I was so burned out by this point I didn’t bother to research blackwork alphabets so I just made something up. I embroidered the start and end dates as well even though that’s a little embarassing to inscribe forever just how long it took me to finish this. Little details really make this a favorite project. The way I made the leaves twist for the wheat in the tenth row stand out to me. And the three big motifs in the fourth row really irked me for a while – I thought they were too sparse and strange looking – but from a distance they look like circles inside of squares. Exactly as I’d hoped. So here it is, mounted and ready to ship home! I’ve just moved a thousand miles away. It was very sudden and there’ve been a lot of changes and not a lot of time/room to embroider. The reason I decided to post this is because people (according to wordpress’ blog stats) still visit this blog even though I haven’t updated in forever. Thank you to everyone who visits! I never know how people get here (the referral section is always blank) so if people are linking to me and I’m not linking to them or you just want to do a link exchange just contact me through email or comment on this post. Previous posts on the project are here and here. The last band pictured is the seventh of thirteen planned and then there’s the rest of the border sooooo almost halfway there. It’s $79.95 at the official site but it’s $52.97 on Amazon. And guess who just got paid?! Then it’s so easy to copy/paste into a field that’s the exact width of the sampler and then move it around. Voila! No math! 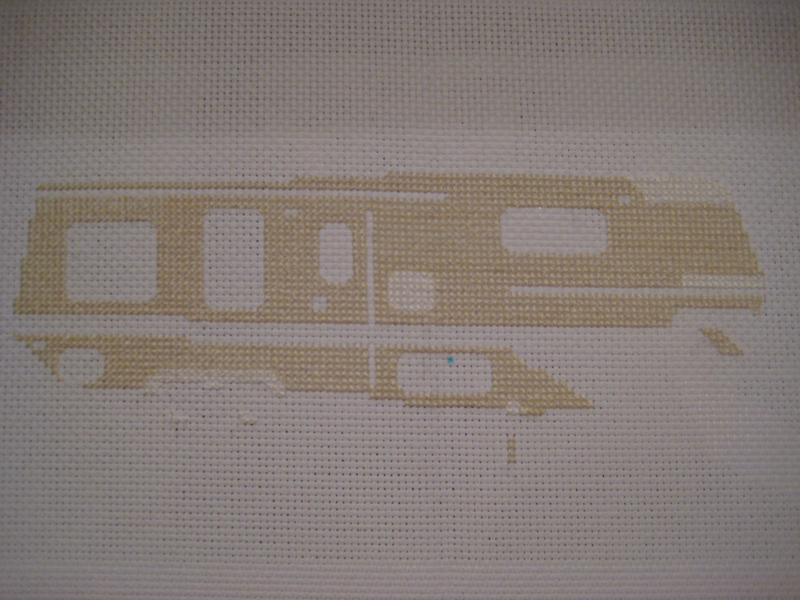 I’m stitching over one on an 18 ct evenweave fabric. If I could start over, which I can’t, I’d choose a different fabric. The weave is really loose compared to aida and I have to be really careful with the tension of the floss. I’m really comfortable with double-running stitch, I like to use it exclusively and the journeys and side-journeys come as almost second nature to me now, but I have to make sure to pierce the middle of the floss on the return journeys otherwise it’s really obvious and the floss disappears into the weave of the fabric. If anyone has any experience, any tips, hints, resources, I’d really appreciate it. I’d also love to hear from anyone using PCStitch or any other design software. 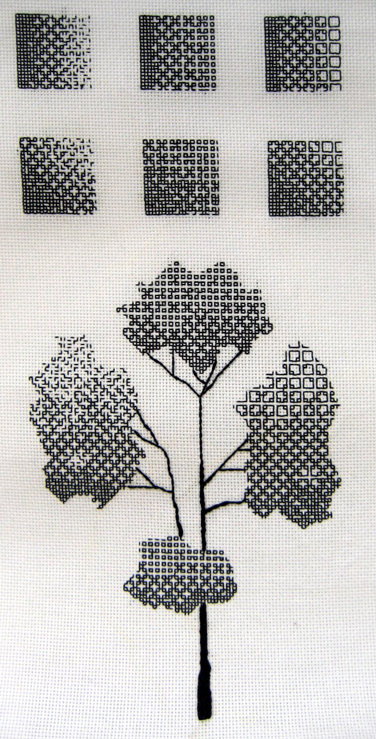 After finishing the two fill-in samplers from Beginner’s Guide to Blackwork I decided to press onward in my self-education. 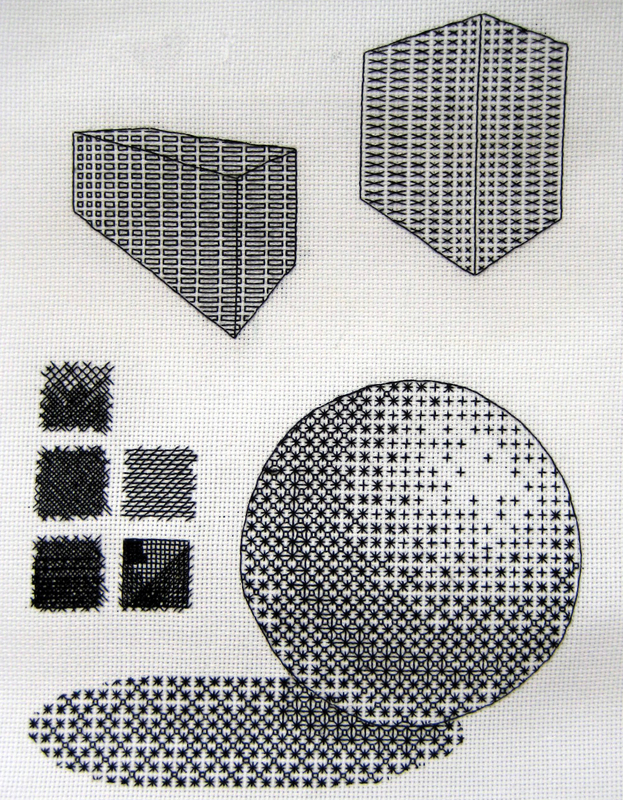 This was my first attempt at manipulating blackwork patterns. I was so ridiculously proud of myself. Here’s a detail of the top portion of the sampler. Each column contains a different interpretation of the same fill-in pattern. The first row in each column has a horizontal, left-to-right gradient, while the bottom row in each column has a diagonal, bottom left-to-top right gradient. 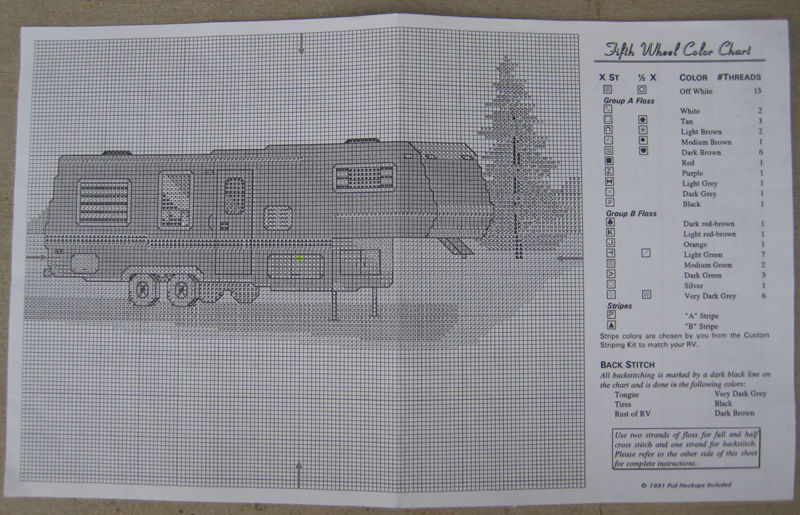 Before I began I charted each variation of the pattern on graph paper. I think of the first variation as a degradation of the original pattern. It begins as an almost solid fill, moves into the pattern and then parts of the pattern drop out until something like seed stitches are left. Everyone I’ve asked so far likes this one the best and considers it the most effective. I’m wondering what other stitchers will think. The other two patterns move from solid fills into the original pattern and then into at least two other patterns. I was ridiculously proud of this as well. I learned that there can’t be an abrupt shift from one pattern to another, or from solid pattern to seed stitching. I had to “blur” the edges by carrying the patterns further in some areas and letting it change earlier in others. When I was a child, I took art classes for years at the local art museum and could wield a pastel or Prisma color with ease but it’s been years and needle and thread are completely different mediums. It’s satisfying but frustrating having to plan every single stitch. 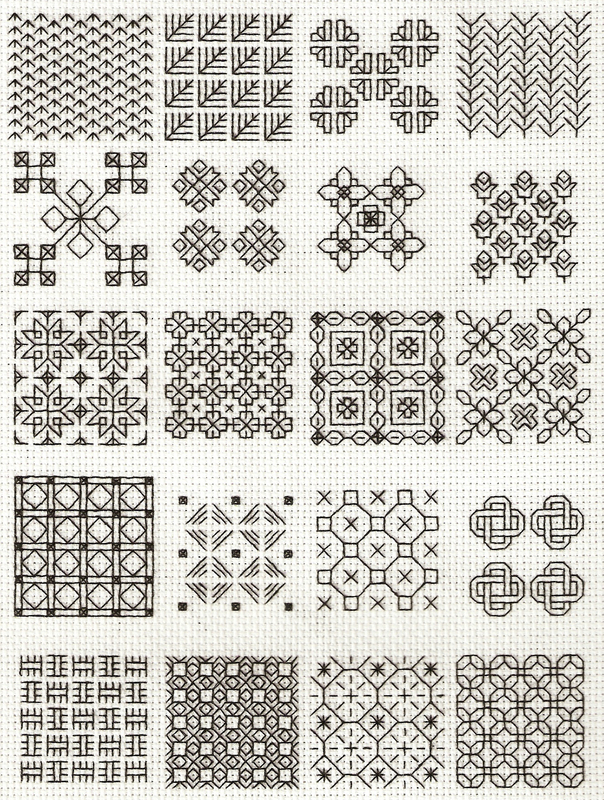 There’s nothing zen or meditative about this kind of blackwork. The tree is inspired by a design in 4000 Flower & Plant Motifs by Graham Leslie McCallum. The patterns in the top three areas correspond to the columns above them and the bottom little bunch is the middle pattern repeated because I felt like it. Here’s a detail of the tree. Perspective in blackwork! I decided after relearning shading, I’d go on to the next lesson in any Beginning Drawing class and relearn perspective in this medium. I used really simple patterns for the boxes, x’s and squares so as to keep the project from spiraling out of control. 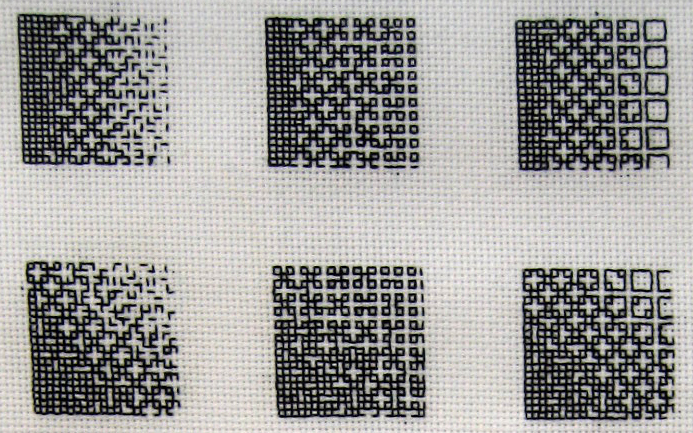 In the right, which was the first attempt, the pattern stretches away from the viewer. This is my favorite of the two because the optical illusion makes it appear as though the sides of the box curve in. In the left box the pattern stretches towards the viewer. I don’t like this one as much though that may be because I rushed it and stitched over four blocks of aida for three columns and that was just too much. I’m not sure either are effective at communicating perspective, though I guess I shouldn’t expect realism. I’m glad I stitched them up and can look back at these and apply what I’ve learned to future projects. I wasn’t about to try a cone or a pyramid so the next test of perspective was a sphere. I spent a lot of time on this (be sure to click on the image to enlarge it, then click again to magnify it). I researched shadows and reflections and discarded a number of images before settling on this view. It was hard to know when to stop. I was constantly aware that it would be really easy to ruin it by overworking it. 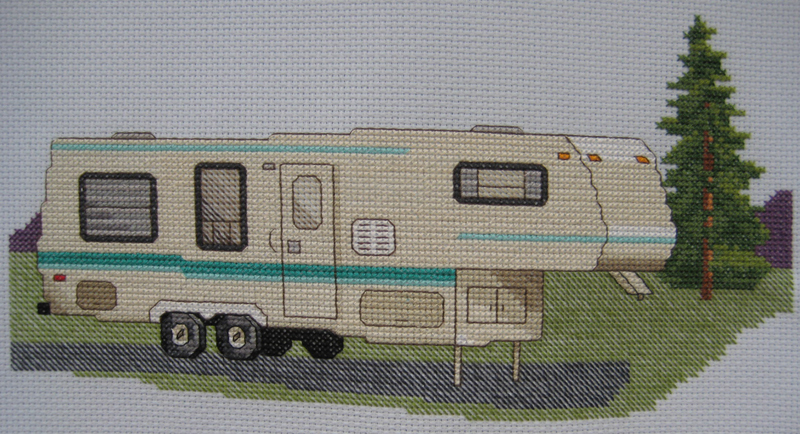 I loved stitching this! I’d really like to use this to give a piece a “sketched” look. The left middle square is the best candidate I think. I’d want to practice some more to learn how to construct gradient with crosshatching but it’s such a great pattern. The bottom two squares are my attempts to create a solid fill with crosshatching by stitching on both the x and y axis as well as both diagonals. It got a little cramped. I knew my needle should go in a general spot but I couldn’t be sure and the pattern just got too muddled. 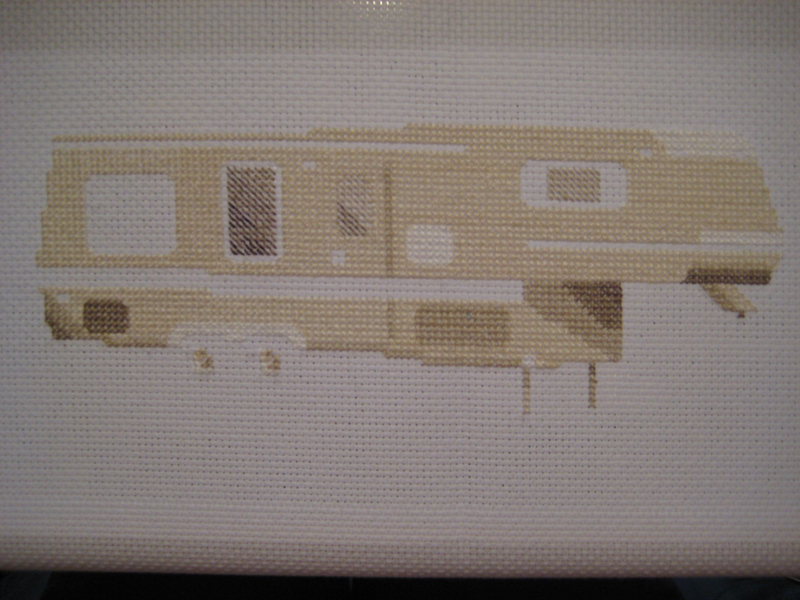 I don’t know if I would just use cross stitch or what for a solid fill. More practice is in order, obviously. The topmost square and the right square in the middle row are a bit weird. I wanted to see what dropping out parts of the pattern would look like. I’m still not sure. One thing I do know: it’s incredibly time consuming. These are stitched on 18 count aida and come in at just under an inch square. This pattern also consumes a ton of floss. I stitched this a while ago so I can’t remember exactly how much this sampler used up but that and the time factor were enough to make me give up for the time being. It’s definitely something I want to revisit though. I don’t consider these samplers as finished products so neither should you but rather as sketches and opportunities to learn. I hope this was informative to you and you can apply it to your own stitching or was at the very least entertaining. 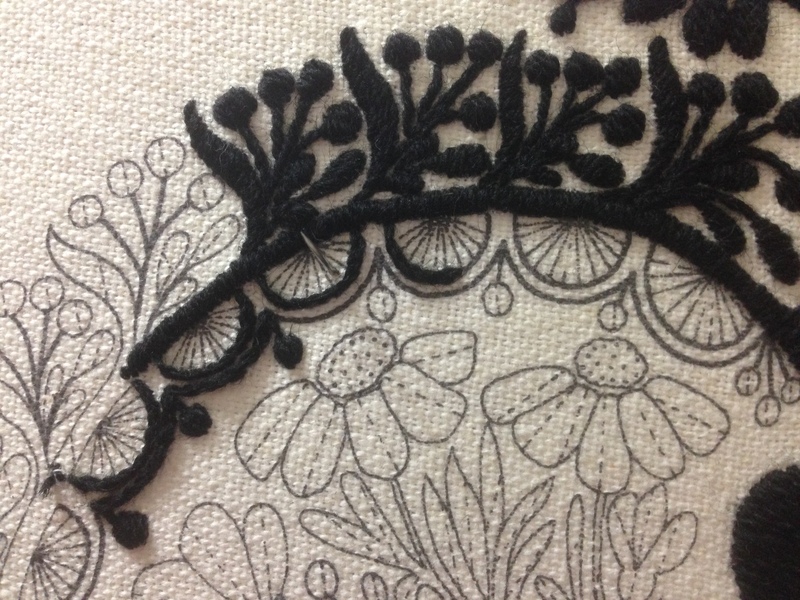 When I first got interested in blackwork I decided I wouldn’t burn myself out on it. Typically, when I start a new craft I read as much as I can about it and then tackle a project that captures my interest. Usually, this involves a skill set I just don’t have yet. 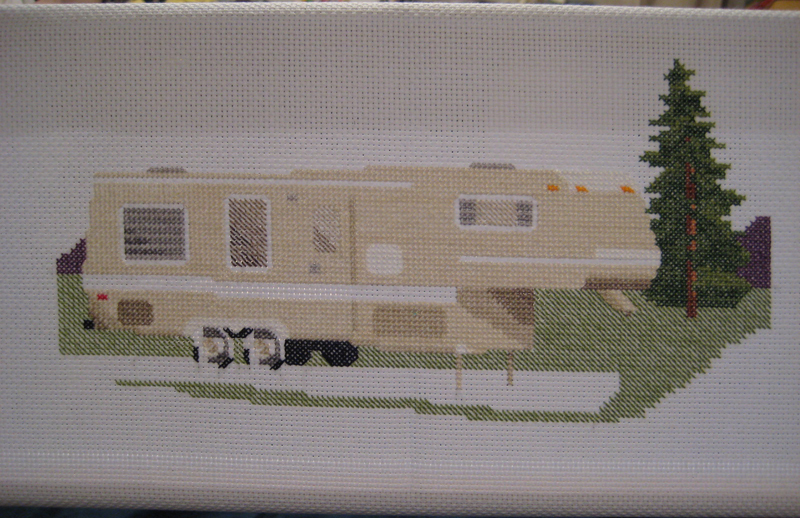 I slog through it until it’s finished or I just can’t look at it anymore. I was done before I knew it. There are two other pages of fill-in patterns but I’d cooled my heels for far too long and I had to move on to something else. So, in addition to craft ADD I am a bit of a craft snob. When I got into embroidery as an adult it was ribbon embroidery that caught my attention. It was so striking and unlike anything I’d ever seen that it seemed better than anything else. I wondered how anyone could not be into ribbon embroidery if they’d heard of it and concluded most people didn’t know because it didn’t seem very popular. Well, that is the wrong attitude to have-pride goeth before the fall and all that. I soon moved on to embroidery with cotton floss (it appeared to have it’s uses-that and my mother had a huge stash) and crewel work but I vowed never to get into counted cross stitch. 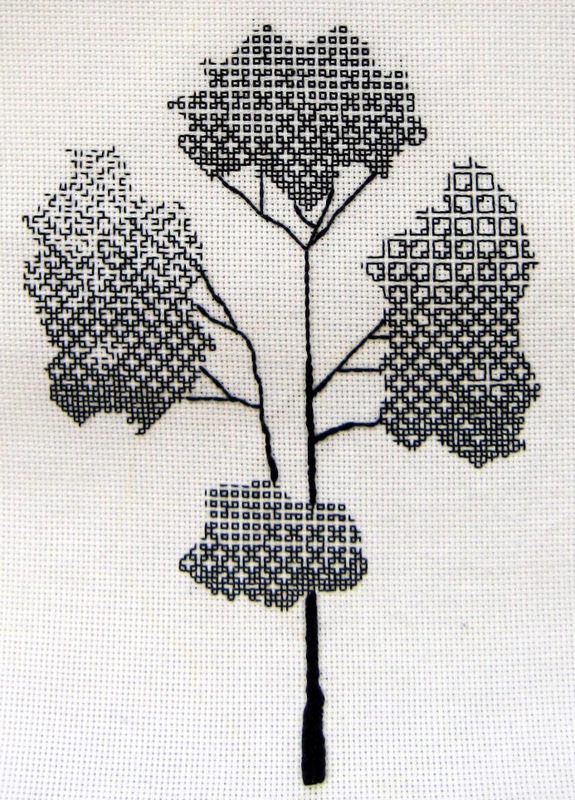 I’ve moved on once again and the thing that’s caught my interest at last (hopefully permanently) is blackwork. I found working counted thread embroidery to be extremely relaxing and meditative. 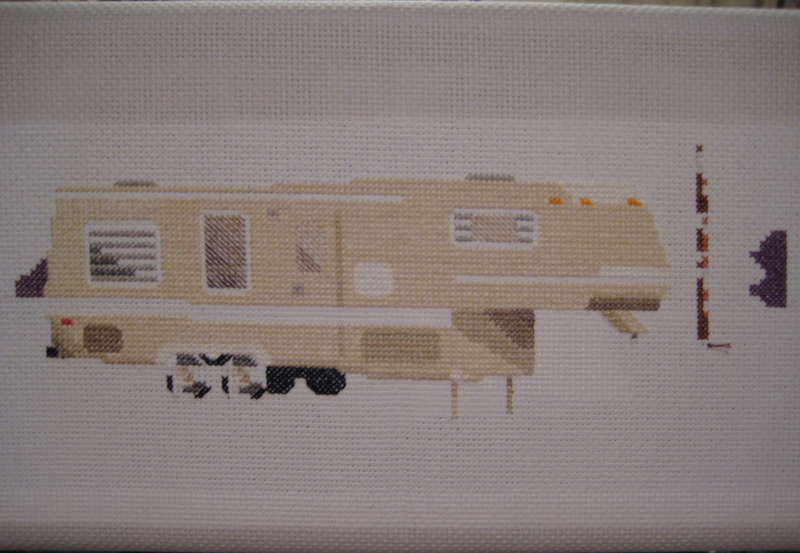 But I still thought counted cross stitch was lame. It seemed too easy to me. Just following a pattern and laying down colors. Of course, this can describe all embroidery. I regularly search eBay for embroidery kits. In an effort not to miss any because sellers are often woefully inaccurate (or creative if you want to be positive) when they list I simply search for “kit” in the Needlecrafts & Yarn subsection of Crafts. In fact, I have a saved search set up to notify me when new things were added to eBay that matched my search terms. This is close to 600 items a day. How do I know this? Because I quickly made use of the RSS feed button at the bottom of the search results page and added the feed to my Google Reader and the reader counts each new item. The new Search Experience eBay is betaing doesn’t include the RSS feature so I’ve opted out for the second time. 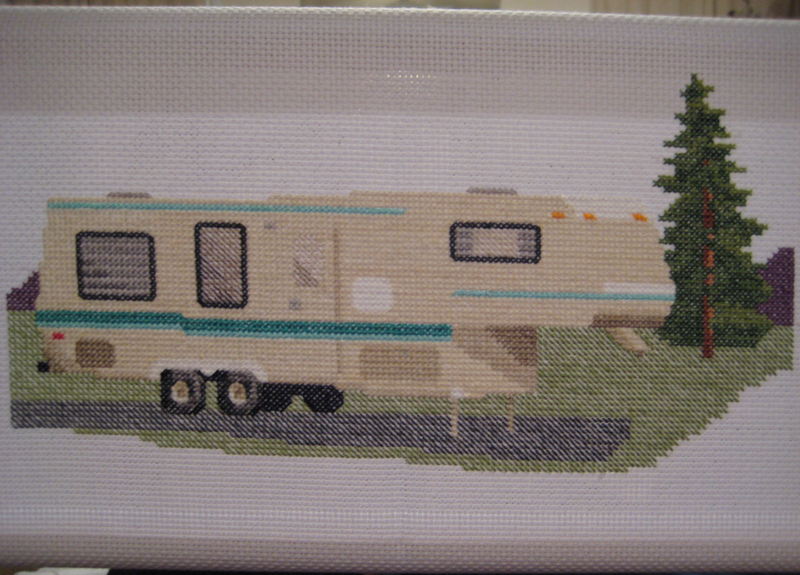 I hadn’t done counted cross stitch since I was a child so I did the best I could. 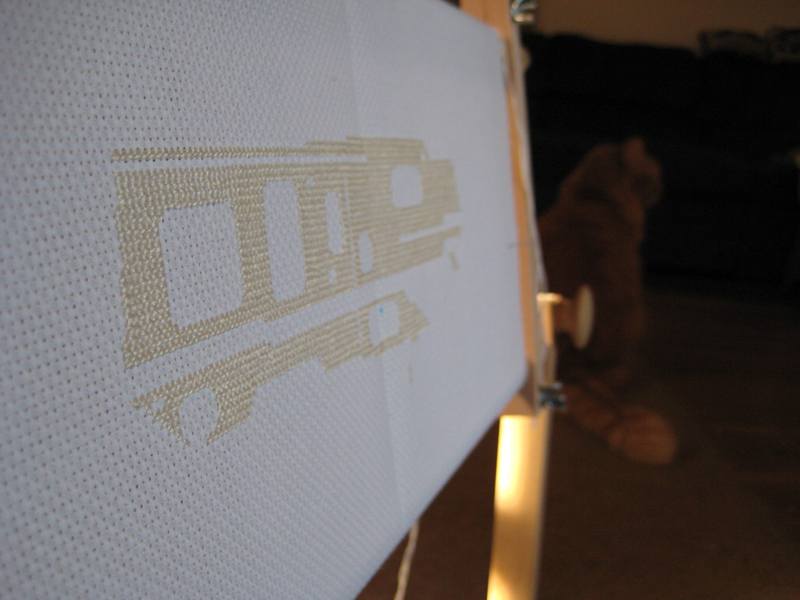 I didn’t know to mark every ten blocks with thread or why one should work a section completely before moving on. As a result there are a few mistakes and why you’ve seen the development of the piece color by color. 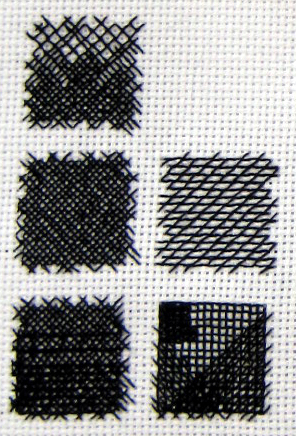 I should have known I’d find counted cross stitch just as relaxing and meditative as blackwork and I’ve been thoroughly cured of my CSS prejudice. Well, except for the really lame kits. I struck gold twice! 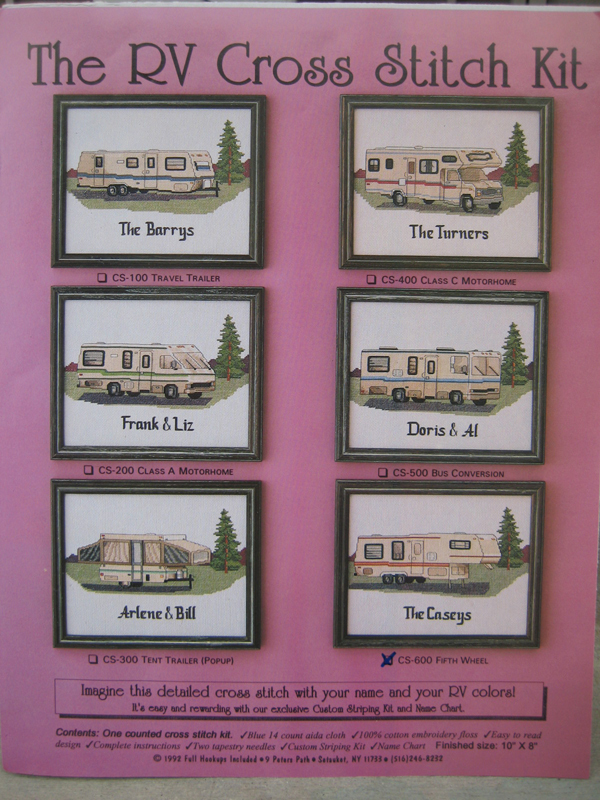 I found another RV kit-this time for the Class C Motorhome.